What could be more romantic than being married at sea? We all dream of such an occasion and most young girls will already have played out this scenario with their Barbie dolls! So just imagine now you are grown up how spectacular it would be to be married aboard a wedding yacht charter. Nicholson Yacht Charters can help you to make your romantic dreams come true with a wonderful wedding ceremony on-board a yacht. So to combine the most romantic day of your life with a wonderful location, why not choose a wedding yacht in sunny Miami? Just imagine the scene if you will; friends and family surrounding you as you pledge to love each other for all time. The sun will be shining down on the happy couple and an array of brightly-colored flowers will be adorning your wedding yacht. It really does not get much more romantic than that. The most perfect thing about getting married on-board a wedding yacht is the fact that the Captain will conduct your ceremony. All of our captains are professional and fully trained and so you can rest assured that not only will you have a handsome uniformed Captain conducting your wedding yacht ceremony, you can also relax in the knowledge that yours, and your family’s, safety and well-being will be at the forefront of his mind at all times. Nicholson Yacht Charters have been in business since 1949 and there has been no scenario we have not encountered before. No matter how diverse the needs of our guests are, we will always strive to provide absolutely everything you could wish for or think of when you charter a wedding yacht from the experts. ‘The customer is always right’ may be viewed as something of an old-fashioned saying these days, but it is a maxim we hold close to our hearts. We have a proven track record of excellent customer service and are proud to showcase it to all of our clients. 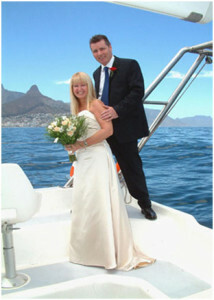 Each and every person who comes aboard is treated with an equal courtesy and respect and so you can be assured that not only will you and your spouse-to-be feel special, so will the entire wedding party when your wedding ceremony is booked on a luxurious wedding yacht charter with Nicholson Yacht Charters. You will have the opportunity to discuss your personal food preferences well before the important day itself so you can think about more important things such as the dress and shoes, rather than needing to worry about the fact that you have a vegan guest and one who is allergic to nuts! Our trained chef will deliver the finest cuisine available along with matching wines etc. which will make your day feel as if it is taking place in one of the best hotels in the world. So bring yourself and your wedding party, the all-important dress and shoes; don’t forget the wedding rings and then leave everything else up to us. You will have the most romantic and memorable day of your life when you book a wedding yacht charter with Nicholson Yacht Charters.